Did you know that in 2015, nearly 2/3 of U.S. adults had smart phones, up from 35% in 2011 (PEW Research)? We fell in that statistic – adopting smartphones for my husband and I in early 2014. One of the reasons we took so long to buy them was because we didn’t want to take on the expense that came with smartphones. 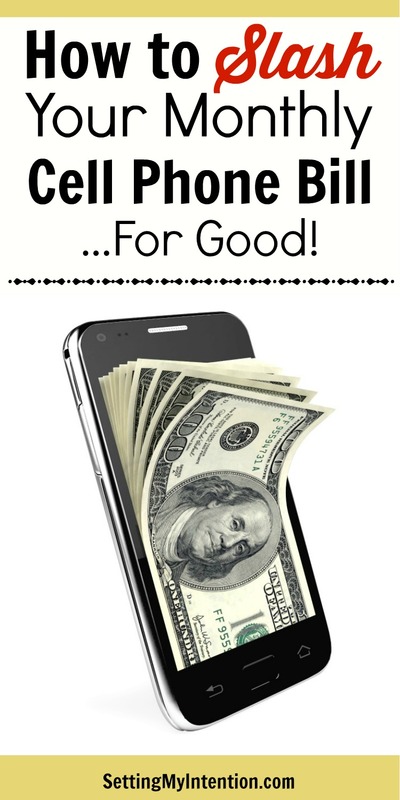 Here’s how you can save money on your cell phone bill. Cell phone bills can be a “budget buster” – and is one area that can be cut down if you’re looking for ways to reduce your monthly spending. The average cell phone bill can be over a hundred dollars a month. Does it have to cost that much? So how do we keep our cell phone plans from being a financial burden? First, question what your needs are versus your wants. When my oldest son was in 5th grade in 2012, he was the only child without a cell phone. Fifth grade is generally the first year of middle school in our city, particularly for the magnet middle schools that draw students from all over the city. Other parents were shocked when we were sending our son across the city (in a yellow school bus) without a cell phone. I told them exactly what I told my son, “If you need a cell phone, politely ask any of the other students who have cell phones if you can borrow theirs.” There were a handful of times he had to borrow another students phone to let me know the school bus broke down or was running late. It really didn’t warrant him needing a cell phone. Did he want one? Absolutely. Did he need one? No. When my husband and I began using smartphones, we started with Virgin Mobile. We could bring our old phones, there was no contract, and the monthly plans with taxes and fees were under $35 each. We still use them for two of our phones (for now). When we (finally!) bought my oldest son his first phone, it was with an AT&T Prepaid GoPhone. It was a very cheap phone and it was only for talk and text, not data. (Can I just say that a talk/text plan is hard to find these days?!?) He was traveling on public transportation at that point and we wanted him to have a functional phone in case of emergency. He eventually lost the phone and it never re-surfaced (as it had in the past) so we cancelled that plan and waited to replace his phone until he graduated from middle school. Our most recent find is Republic Wireless. They have plans that include talk, text, and data starting at $15/month. The only catch is that you have to buy one of their smartphones – and they’re not incredibly cheap. We thought of it as a large investment upfront for a smaller cell phone bill in the future. We figured that it evens out in the long run. My husband LOVES his new Republic Wireless phone. When we (okay it was really just me) decided to upgrade to smartphones I bought two iPhones on sale during Black Friday. My husband hated using it and it was glitchy for some reason. We ended up sending his back and he went to Radioshack and bought himself a cheap Android smartphone. The problem with that phone was that it had very limited storage. His new android phone through Republic Wireless has loads of storage and he is able to download apps that make life easier for him and help us as a family! He has the basic plan with 1GB of data per month and hasn’t needed anymore. His bill through Republic Wireless is $24.86 every month total. That amount of data might feel too small for you, but ask yourself the first question – is more data a want or a need? One thing to consider is that this type of plan is best for teens and adults who are most likely NOT going to lose the phone (I know this is hard to predict). We ordered a very nice, new smartphone for my oldest son with Republic Wireless before he started high school – and he quickly lost it traveling to school. It doesn’t save you money in the long run if you lose the “not cheap” phone and can’t use the “cheap” monthly cell phone plan. (insert sad face) He now uses his dad’s old smartphone. 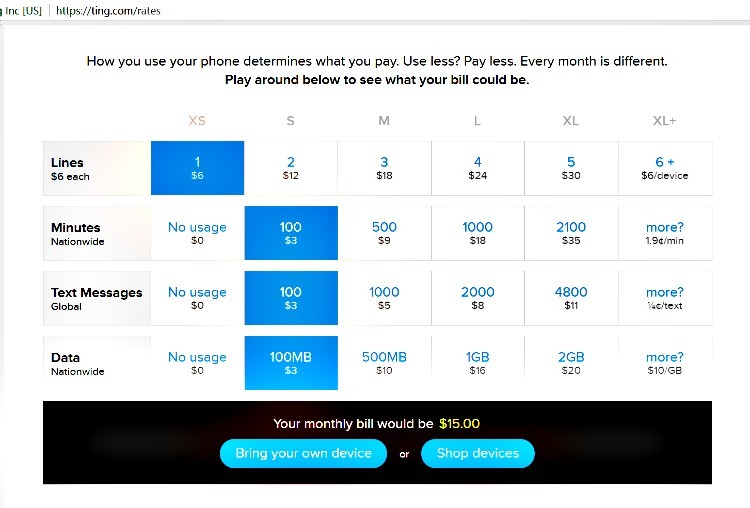 Ting is a great solution for customizing what kind of cell phone plan you want for yourself and your family. Our middle son needs a phone and I was eager to try Ting’s service, particularly because they have a “family plan” option. We used one of our old cell phones with their Bring Your Own Device (BYOD) option. It was super easy to check if the phone was compatible with their program and to activate it within a few minutes. There are many different options of plans but you essentially only pay for what you use. The basic charge is $6 per line. This is a great option if you want your children to have a phone but don’t necessarily want them to have data, or to have limited data. I’m setting up alerts so that when he gets close to the limits that I had in mind for the month, he’ll get a text. The data will just be deactivated for the rest of the month if he exceeds it. I’m planning on moving me and my oldest son to Ting after we finish out the month. The cost of 3 lines will be cheaper than our 2 lines with our other carrier. If you’re curious if Ting will work for your family, click HERE and you can get $25 off a device or $25 in Ting credit. I was a late adopter to smartphones, but three years later and I can’t imagine life without it. As PEW reports, smartphones are essential as access to the internet for cell phones. They are also a financial burden to nearly one-quarter of smartphone users. So if you want to lessen the financial burden, consider changing carriers. It could save you hundreds of dollars. How do you save money on your cell phone plan? This post will be shared at these weekly link ups. I’ve never heard of either of these companies. We’re hopefully a long way from needing cell service for our kids, but I love knowing there are inexpensive options! My in-laws are thinking about getting new phones, but the cost is so expensive. And, honestly, they won’t use most of the features of a smartphone anyway. I’ll definitely have to pass this information along to them! Oh good! I hope one of the plans is a good fit for them. Cell phones can definitely be a budget buster! I love Republic Wireless and I’m happy with my plan and phone! Yes, you can find alternative and more affordable cellphone plans out there. Yes! My husband is SO happy since he’s switched! Glad to hear you’re another happy customer! I can’t remember the conversion of pounds to dollars, but it sounds like you have a great plan that works for you! That’s great Laura! You can’t beat that deal! We have “dumb phones” and also a super-cheap plan through Consumer Cellular. It has made such a difference for us! I looked at Consumer Cellular as well! They look like a great option. I don’t think they worked with the phones that we had so we ruled them out.